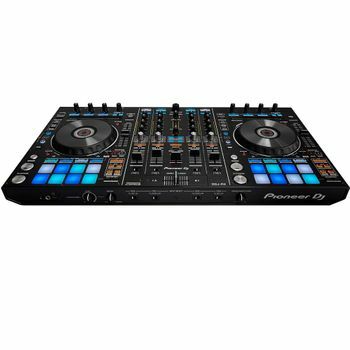 Pioneer DDJ-RX Pro DJ Controller- Rekordbox DJ- 4 Channel DJParts - All Variety of Parts that DJ Needs. Pioneer DDJ-RX Pro DJ Controller- Rekordbox DJ- 4 Channel Make it your own. Take control. This 4-channel controller allows you to perform with all four of rekordbox dj’s decks, and each channel has its own level meters and trim pots for even greater control. Or you can use the DDJ-RX as a stand-alone mixer. Designed to deliver the tightest possible integration and fast response with rekordbox dj, this controller mirrors the software's layout to give you effortless control. Hit the 16 back-lit rubber Performance Pads to instantly trigger quantized Hot Cues, Slicer and Pad FX. The DDJ-RX's full-sized jog wheels are optimised for a perfect scratch response and you can use Jog Feeling Adjust to set your preferred resistance. The jogs have illuminated cue point markers and an accurate countdown for even greater precision. This controller comes with four preset Sound Color FX buttons - Noise, Crush, Pitch and Filter - which you'll be able to customise in the future with upcoming rekordbox dj Plus Packs.